Welcome to Disney Springs. That’s right, it’s not Downtown Disney any more, it’s Disney Springs and things are really hopping at Disney Springs. Pleasure Island is gone and there is a whole bunch of new shops and restaurants that have opened up. So let’s Spring into Disney Springs and take a look at what’s happening. 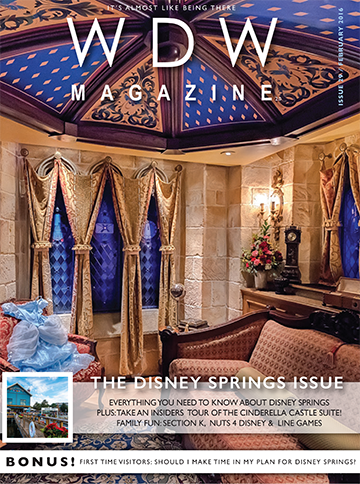 We kick off this month with a cool article on the Story of Disney Springs. It tells the background and the history of this “new” village. Then there are articles on the Dining, Shopping and Entertainment at Disney Springs complete with great pictures and videos. In the Helping Hands section this month Dave starts it off by answering the question of whether or not a first time visitor should take the time and visit. Then we look at the First Aid centers at Walt Disney World. Very Helpful. Finally we answer if you should Splurge or be a Scrooge when it comes to the entertainment options in Disney Springs. Every month we talk about interesting places in The Best of WDW, but this month may be the most interesting for a while. The attraction of the month is Living with the Land which is one of my favorites. The Resort is the Boardwalk Villas another really cool place. The gift shop is Bay View Gifts and the restaurant is Olivia’s Cafe at Old Key West. Like I said, an interesting list. Section k! is growing. This month we add a new feature to Section k! it’s called Parks in the Parks. It’s a “serial” about Callie and Landon Parks who are a couple of cool kids who get to spend a lot of time at Walt Disney World. Wally D. Wilkerson is back with a ‘Pin” problem. Emily and Hanna talk about Disney Springs in For the Love of Walt Disney. Lisa shows us how to build a Minnie Wind Chime and we have all our games, coloring pages and puzzles ready for you to download. What are you saying this month? It’s here in the FanZone. It starts with a graphic from our Disney Springs questions on Facebook. Then we have a really, really cool interview with the Berry family who won a once-in-a-lifetime vacation to WDW. Yes, they got to stay in the Castle Suite. (Lucky Ducks!) James writes about the feelings of home he gets at Walt Disney World. He also talks about the changes at WDW and the good and bad of them. Greg has our monthly Vinylmation and Tsum Tsum report and finally there’s this month’s photo contest. This is really good. How would you like a tour of the Cinderella Castle Suite? One of our photographers, Mike Billick was able to visit and take some incredible pictures. You don’t want to miss this. Amphicars, the News, Fun Facts, a Throwdown between Disney Springs and Downtown Disney in Anaheim and some of the Gone but not Forgotten History of WDW. Wow. That’s a bunch of great articles. A great way to finish a great issue. What are you waiting for? Dig in.